A new $3.5 million fund at the University of Notre Dame has been established to help launch student-led ventures and further strengthen the educational component of the University’s ESTEEM Graduate Program. The funds for the program will be from gifts made to the University by John Jeuck, the former dean of the University of Chicago Booth School of Business, in honor of his close personal friend, Philip J. Purcell III, a member of the Notre Dame Board of Trustees. The ESTEEM (Engineering, Science, Technology and Entrepreneurship Excellence Master’s) Program is the first multidisciplinary graduate program in Notre Dame’s history. Developed in collaboration with the College of Science, the College of Engineering and the Mendoza College of Business, and housed at the University’s state-of-the-art Innovation Park, ESTEEM provides science, technology, engineering and mathematics (STEM)-educated students an unparalleled opportunity to deepen their technical talents while also learning the business and innovation skills they need to commercialize research and bring new ideas and technological advancements to market. All investments from the fund will be determined on an annual basis through a formal and robust proposal and review process. Business plans will be accepted from any undergraduate or graduate student enrolled in the University and will be reviewed by the ESTEEM class as an integral part of the due diligence process. Only ideas that have the highest probability for success and impact will be recommended by the ESTEEM students to the fund’s advisory board for potential funding. Purcell will chair the advisory board, which also includes several other members of the University’s Board of Trustees. David Murphy, former president and CEO of Notre Dame’s spin-out success Better World Books, currently associate dean of entrepreneurship for the Colleges of Science and Engineering and director of the ESTEEM Program, will lead the Irish Innovation Fund, and will also serve on the fund’s advisory board. All investments will be approved by the advisory board as well as Notre Dame’s provost and must be consistent with the mission and role of Notre Dame as a Catholic university. 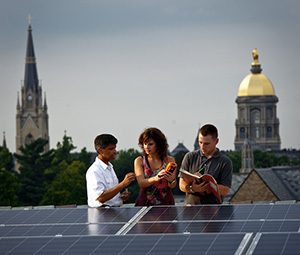 “Notre Dame is ideally suited to not only provide a unique educational framework for our STEM-educated graduate students to learn how to commercialize research and develop viable business opportunities, but also to help create and advance an ecosystem of entrepreneurship and innovation that drives the long-term creation and commercial success of new ventures that are launched — and do it in a way that delivers on Father Sorin’s vision for this great university to be a ‘powerful force for good in the world,’” Murphy said. Originally published by William G. Gilroy at newsinfo.nd.edu on February 25, 2013.